You might get many files in AVI format. 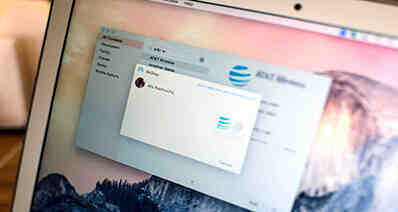 AVI is a well-known format, which is commonly used to store video or audio information digitally in order for playback. But if the AVI video file is compressed with some codecs, you must have the same codecs installed on the program or player in order to play the AVI video. So there might be times you have to convert the AVI to other format for playback without any incompatible issue. Most of iOS users will struggling ways on how to convert AVI to MOV for their iPhone or iPad device. Below we will pick up top 10 best AVI to MOV converter helping you to do the conversion without any problem. OnlineVideoConverter is a free AVI to MOV converter online web application. It lets you to convert the video format easily with no software download. This online video converter allows you to convert and download the video without registration required. You can use it to convert video and audio formats including AVI, MP4, MP3, ACC, OGG, WMA, M4A, MPG, 3GP, FLV and more formats. It also allows you to convert online videos from YouTube, Vimeo, Metacafe, and Dailymotion for free. This online AVI to MOV converter enable advanced settings on the video. • It supports many video and audio formats. • You can directly download and convert online videos. • No registration is required when using this online tool. • There is annoying ads during the conversion steps. • It got stuck in the video conversion window without tell the reasons. CloudConvert is a remarkable online AVI to MOV converter, which allows you to convert more than 200 file formats and file types. It confidently telling the users that it has the ability to convert any format to any format. You can upload the files with the size limitation at 1 GB. And batch conversion is supported, but you need to make sure all the files uploaded not exceeding 1 GB. 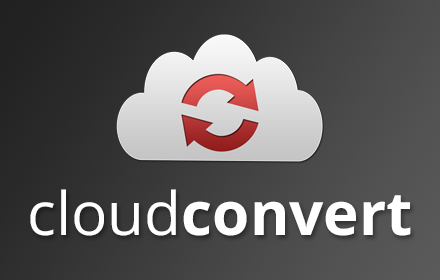 CloudConvert lets you to convert formats in MOV, AVI, MP4, WMV, WebM and many more. • It supports almost all video, audio, image, document, archive, ebook, presentation and spreadsheet formats. • You have multiple options to upload the files from, including OneDrive, Google Drive, Box, Dropbox, and URL. • You are able to upload multiple videos, audio, documents, and other files at one time. • It only supports to convert files less than 1BG once. • The free version only get 25’ conversion minutes per day. Online-Convert is another free AVI to MOV converter online application. It can help you to convert and download the video fast. You can upload your AVI video file from local folder or directly enter the URL for the video. Furthermore it also lets you to convert videos from your Google Drive and Dropbox online storage platform. Online-Covert supports to convert videos in formats of mov, 3G2, avi, 3gp, flv, webm, ogg, mp4, wii, psp, xbox 360, iPhone compatible formats, Android compatible formats, iPod compatible formats, and more formats for free. • It supports to convert any format videos. • You will have output format customized options to enhance the video quality. • There are basic video editing tools to do simply editing on the videos. • You have to register or log in the website to activate the conversion. • The conversion time can be very long. Zamzar is famous free online AVI to MOV converter site. It supports a large number of video conversion formats including mov, mp4, mkv, flv, mp3, 3gp, and more. Zamzar allows you to convert video files or URL for the video from online video-sharing sites. After the conversion, you will get an email for downloading the output video. The unique feature of this site is that it allows you to manage your converted video files easily. • You can use it to convert a number of video, audio and document formats. • It help you to download online videos and convert it to your desired format directly. • You need to register the site. A certain payment fee is needed to enjoy advanced features. • It only supports to convert the file up to 100MB. ConvertFiles is an online AVI to MOV converter free software that helps you to convert video files and audio files to other formats. It is the online tool that make sure your uploaded video files for conversion are kept in a secure way. 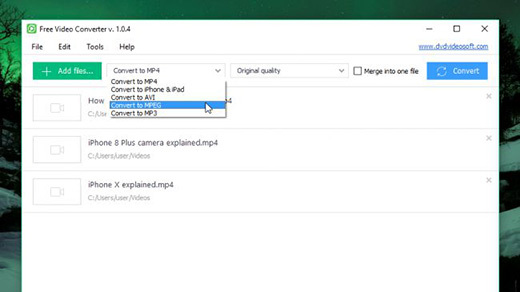 With ConvertFiles, you can convert formats in mp4, mpeg, mov, mkv, avi, ogg, 3gp, wmv, and many other formats. Besides, you are able to download the online streaming videos and convert them to other format for free. • ConvertFiles can keep your uploaded videos and files safely. • You can directly stream video from YouTube, Liveleak, Metacafe, megavideo, etc. • You will have file size limitations in 250MB. • There are annoying ads throughout the website. iSkysoft Video Converter Ultimate for Mac (or iSkysoft Video Converter Ultimate for Windows) is the highly recommended AVI to MOV converter for Mac and Windows users. It is particularly designed for media files format conversion. So you will get no compromise on the video quality and conversion speed. This video converter software allows you to convert videos and transfer to your mobile devices and portable devices directly. • 90X faster conversion speed and lossless conversion quality is supported. • You can convert any video and audio formats to more than 150 formats. • Besides video conversion, you can download, edit, burn and transfer videos. • No cons observed so far. Freemake Video Converter is a free AVI to MOV converter. It has the features of fast and flexible conversion. Freemake is excellently support input and output formats. This video converter not only can convert videos from your local folder, but also can download online videos to specified format. Its built-in editing tools allows you to customize the videos. • You can use Freemake to convert, edit and download videos and audio files. • It is a powerful yet easy-to-use free video converter. • The first time you install the Freemake, some of its features will be locked and you have to wait 3 days for the Web Pack to unlock the features. HandBrake is a free yet powerful AVI file to MOV converter for Mac, Windows, and Linux. HandBrake supports quick conversion and has the ability for presetting. It is a well-known free video converter for Mac, but less popular in the Windows world. While it doesn’t indicate that HandBrake should be overlooked among Windows users. It is a great choice for video conversion on different platforms. • Multiple platforms are supported for users to convert videos. • Besides video conversion, it can crop videos and add filters to the videos. • There might be malware when using HandBrake. And you have to wait endless for the upgraded version. DVDvideosoft Free Video Converter is an easy-to-use and quick AVI to MOV converter. After the conversion, you will get the output video quality in decent. And it supports batch conversion, so you can import more than one media files to the program and convert them once. Free Video Converter supports a large number of formats for import, and also lets you to get a lot of format for output, for example, iOS native video and audio format, DVD, AVI and MPEG. • It is easy to use with simple interface. • You can combine multiple AVI videos into one MOV file. • The conversion speed is very fast. • You have limited conversion options. • There is a watermark on your video after the conversion. Any Video Converter Free is a fast AVI to MOV converter for Windows and Mac users. It supports to convert a number of file formats. You can use it to convert offline videos or online videos. When you are enjoying a YouTube video, you can use Any Video Converter Free to download the video to your preset format. Video editing options is also available in this free video converter. • It supports to convert online and offline videos fast. • It has the ability for multiple format support. • You are able to trim the video, or add filters and other effects to the video. • The free version comes with limited features, you have to pay for advanced features.